I hate to say it, but I’m fairly certain I was an obnoxious little snot rag, and not the embroidered handkerchief-kind. Now, you might be thinking, “Oh, no, Lani, you were a darling little angel with cute little wispy pigeon wings!” But I assure you, I was more like the disgusting distastefully-colored droppings pigeons leave behind. Why are you being so hard on yourself, Lani? (And why are you talking in third person, ya nitwit?) Well, it’s like this. I talked back, threw crumbled up paper behind the teacher’s back, cheated, skipped school, failed P.E. from “lack of participation”, put my makeup on during English, had to go to summer school for being a lazy, fell asleep in History (drool much? ), swore vigorously and profusely, and considered high school to be a colossal “Why is there celery in my food?” waste of time. On the other side of the paper bag-covered book, I was into rock music, reading, magazines, writing really profound and poignant things like “love is an illusion,” and theatre. And here we have what saved my high school years from being utterly useless, stupid and filled with teenage angst gooey goodness. 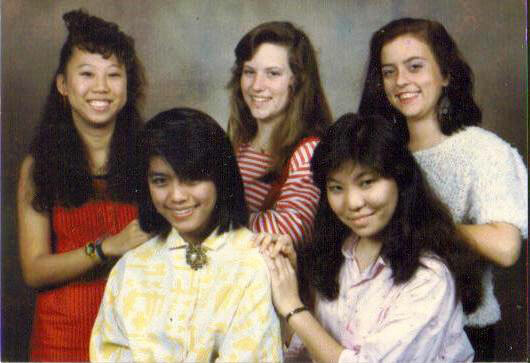 Ohhh, lordy, did I love my perms and aqua net. I don’t know if I would have even considered taking theatre if it hadn’t been for my brief touch with performance and fame that I experienced in the 8th grade. We were living in Barstow, California (remember, the armpit of America) and at the time, my bro and I were attending a Christian school. We were reading Exodus, and learning about Moses and the Israelites high-tailing it out of Egypt after all those nasty and rather excessive plagues descended upon Pharaoh and his people. So, our teacher gave us the assignment of presenting the parting of the Red Sea, the great escape of the nice and previously-enslaved Hebrews, and since this was the first and only creative writing assignment I can remember ever being given at this school, I was eager to get started. Lying on my stomach on my mother’s bed, with pen and paper, I decided it would be fun to present the dramatic parting of the Red Sea as a news reporter. I would be Lani Cox for Eyewitness News capturing on camera the exciting event as it happened, and even grab a quick interview with Joshua, who I fancied to be a hottie. When I finally did see what a full-scale high school theatre program looked like, I knew I couldn’t compete with the big stars I saw on stage. It wasn’t that I was intimidated, it’s just I knew I didn’t have that passion and drive for it. I joined the program nonetheless, and it was rewarding, serious work and it made my last two years of high school worthy of something. I think it kept me out of trouble, too. What made theatre great, was being funny, being part of a dynamic group and making lifelong friends. After high school, my fellow thespians pursued degrees in theatre, moved to NYC, or in some way stayed connected to theatre. What amazes me is how practical I was in this regard. I knew I didn’t have the right looks and I didn’t want to go through the endless rejection and struggle. Again, it’s not my passion, and I didn’t think I was good at it. It seemed vain which is super hilarious because eventually I settled on writing, blogging and writing memoir – talk about endless rejection, struggle and “vanity”. So, I was part of this quirky theatre crowd and as a result, I felt loved and that I had every right to exercise my insufferable teenage self. Whenever I’m briefly disturbed in a restaurant or a mall by a gaggle of loud teens, I’m reminded of the girl I once was – full of sassiness. Theatre provided stability, a creative outlet, really great friends, and structure in contrast to my home life which felt hostile, failing and distant. I also had inherited my mom’s old Isuzu Impulse and this allowed me sweet freedom and independence. For as much as I felt my family wasn’t there for me, they did at least, trust me with a car and was loose with curfew. They didn’t have to be strict because my friends’ parents were strict and I was usually one of the designated drivers, so I was home soon after them. High school was driving around with a really killer sound system my stepdad put in, my Nike shoes, my acid-washed demin jacket and a lot of hairspray. What was I like in high school? I was a theatre geek, an obnoxious nerd and an insecure wallflower. I experienced such a range of friendships, schools, acceptance and rejection that I feel I can safely say I understand high school. 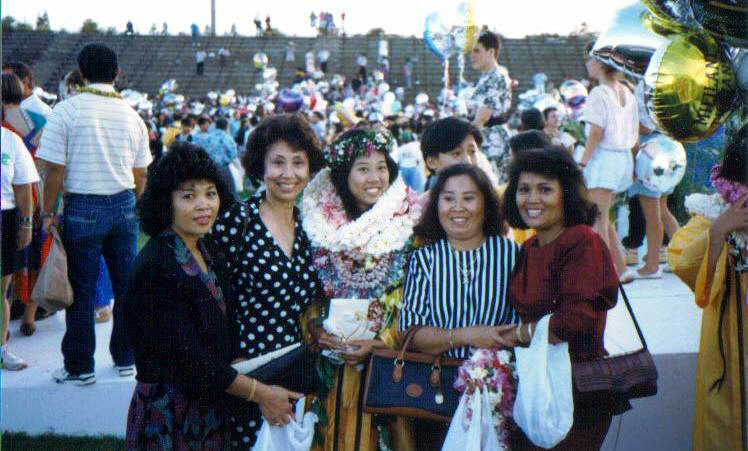 Engulfed by Hawaiian leis, well wishes, and surrounded by my Thai “aunties”, my mother, grandmother and my brother peeking out from behind. MHS, Class of ’91, baby. Thanks, Ashley. I had access to a scanner before I left for Asia, so I have a few old photos on hand. I was overly shy, felt out of place, and just couldn’t wait for it all to be over. Great post, Lani! We are always too hard on ourselves. I’m sure you were not boring. I actually didn’t get into THAT much trouble. At least, I don’t think so in comparison to my peers. The schools I attended in Hawaii, at that time, were rough. There was gang activity and fighting, the smell of weed lingering in certain areas, girls smoking in the bathroom…it was just not as strict and “normal” as the California school that I attended. Ah, this reminds me, the class that graduated before me had the lowest graduation rate (maybe they still hold the record?) and at the ceremony I remember hearing about chairs being thrown. There are lots of amusing stories I could tell you about high school! Sounds like a lot went on in the California school you attended. You could even write a whole book about it. My high school in Singapore was very strict about their students behaving badly. For example, anyone caught smoking would face some kind of immediate suspension from class. The naughtiest thing some of my classmates did was throw wet toilet paper up onto the toilet’s ceiling – toilet paper stuck up there, yes. And those of us who didn’t do this mischevious act feared the wet paper would fall on our heads. Somehow my classmates got away with this all the time. The Hawaii schools, you mean. Yeah, there was an informal feeling to high school. I might have more stories, but you all actually learned. Ahhh, wet tp on the ceiling. Classic. That’s awesome. Those grunge years were my college. I definitely was into my Doc Martins, flannel and jeans which actually worked out well since I was living in Colorado at the time. Gotta love those trends! I went to three different high schools as well. My last one was a sports high school in which I finally was able to combine studies and sports. I was very shy in the first years of high school (in Germany high school starts in fifth grade) but towards the end I was more “normal”. Wow. In Germany, h.s starts pretty early, I’d say. But it sounds like sports helped you in the same way that theatre helped me. I hope adults never underestimate how important it is for teenagers to have extra-curricular activities. It helps everyone, I believe, to be more well-rounded, interesting and dynamic. My goodness though check out that 80’s shot. Two swatches. Hilarious. Like you just *had* to have the extra one for your international jet setter lifestyle. Yeah, I look so silly. It’s funny though. Now I’m curious what you were like in hs! Well we’ll take it as given that we were all a bit snotty. I dunno. It was a kind of intense time because I decided to go to vet school, my mother had cancer and I was the eldest of three sisters, and I proposed to my husband. Occasionally teachers would chide me for not wearing the correct sports uniform or deciding I had higher priorities than turning up to English class and I would be all like oh, seriously, grow up. Wow you sounded like such a rebel in highschool… Who would’ve known? That’s awesome that theatre positively influenced you even though you realized it wasn’t your passion. I was a band need in hs and almost majored in music , but didn’t think I was talented enough nor have the passion to play piano as a career. But it was still a huge part of my learning and taught me invaluable life lessons. Haha, band! Yeah, at my school everyone in band was Japanese. It would be funny looking at the yearbook because there would be this huge picture of the band and one white person in a sea of Asian faces. And I was not a rebel! I was normal (I think). MHS was crazy in those days and I feel like I was just part of the landscape and product of the times. High school has just gotten tamer…you almost never hear about teenage pregnancy anymore. Ah high school. I’ve said many times in the past few years that I would have hated my high school self, and I’m sure I would have. I was homeschooled, but I did go to a co-op, where various homeschoolers would gather to all be taught together. Kind of a mini-school, I guess. Anyway, so I had a kind of normal peer-to-peer experience. But I was shy, anti-social, and phenomenally stuck up. I knew everything, and that was my shtick. I had friends for sure, but we were all of the “We’re soooo smart and superior and above all that pop culture stuff” tribe. Fortunately I did grow out of it. But other than the few times a week I was in co-op, I was at home, so I had a very subdued few years. Nothing of note really happened. I read a lot, wrote a lot, rode horses, and got interested in linguistics. I forgot that you were homeschooled. Why were you? Was it your parents or your idea or both? And it does not sound boring…you had a unique experience. Parents, I would imagine, who want to homeschool their children would be interested in your point of view. Hmm, I wonder if I should do a post on this…I think I could make it long. Basically it was my Mom’s idea, but my brother and I were all for it. I was always too far ahead in grade school, so after skipping half a grade and missing out on the first half of fourth grade, I was pulled out. My brother had a rougher time in school so it was more to combat the abuse than anything. But yeah, I do feel like it was a calmer place for us to find ourselves, and I think that’s what makes both of us interested in varous things. I doubt I would be interested in linguistics, for instance, if I hadn’t stumbled across it in the library and also had plenty of time to study it on my own. Ahhh, interesting. Yeah, you could write about it and even pitch it or share it with homeschool websites, etc. Thanks for writing back…it’s nice to get to know other bloggers (you know, people). Your lucky you both were able to have that option…many parents, I think wouldn’t be able to do it. Ok, I guess I was bookworm, art dabbler geek in high school. My parents were quite strict so those activities provided solace for me. I became more confident around 18 yrs. old onward. Yes, good marks, but not a genius. My siblings had more genius marks. I know, theatre, right? Conjures up obnoxiousness and over-confidence. But so good for kids to have structure and an a creative outlet. Art geek, of course! Omg I HATE high school with a passion! Woot woot! Which is why I’m graduating this week. In high school I am pretty much a wallflower I guess you know observing from the sidelines. My school is just so annoying, so I’m glad to be out this week! Thank you, Lord. Thank you. It’s a bit surreal. I’m kinda nervous. But yes I’m glad to put high school in the past soon.